SOP – Save our Planet! Welcome, welcome to the New Time, the New Age of Oneness. Many today are frightened by the onset of the New Age, but let them look carefully at what is happening and they will see the coming together of some of the most gifted exponents of change. Currently there is in the world a group of wise individuals showing humanity the new situation. Among others, Pope Francis is a unique expression of the people’s ideal, and close to his people. The Dalai Lama, too, is playing a powerful role on behalf of the people he represents. God bless you and forever banish your fears. Q. Is Maitreya still working in the Middle East and North Africa? Q. Has the expected third incarnation of Sai Baba been born yet? Q. Once again there is miraculous progress in the negotiations between the US and Iran in January 2016. Sanctions are being lifted; there is a sweetening of the atmosphere and an historic shift in US-Iranian relations. (1) Could you please say whether Maitreya was involved in bringing this about? (2) Did Maitreya work through an emissary to achieve this? (3) Is Maitreya known to the negotiators on both sides – not as the World Teacher, of course, but perhaps as an insightful and brilliant diplomat or official of some kind? Q. On Friday 23 October 2015, Hurricane Patricia was headed on a direct path to strike the Mexican cities of Puerto Vallarta and Manzanillo on Mexico’s Pacific Coast. Meteorologists called the hurricane the most ferocious storm ever in the Western Hemisphere and clocked its winds at 200 miles per hour. Villages and towns up and down the coast prepared for the worst but as the storm made landfall, its winds diminished significantly and it changed course – the “eye” miraculously passing between Puerto Vallarta and Manzanillo, thus sparing each city the significant damage that would have occurred had they been hit directly. By Saturday morning, the hurricane had all but dissipated, little more than 12 hours after touching land. In the end, Hurricane Patricia left as suddenly as it came and there were no immediate reports of any deaths or damages to major infrastructure. As the Agent of Divine Intervention, did Maitreya play a part in redirecting Hurricane Patricia’s course, diminishing its winds, and ultimately lessening its severity? Q. What exactly do you mean by economic collapse? Are we talking about such a serious situation where we won’t be able to take out any money that we may have in our bank account at all? Or just bigger amounts of money? Surely those who have a few thousand pounds will be able to take that out, or would you advise us to rather take all the money out of the bank? A. An economic collapse usually refers to banks and other large corporations, not to private individuals. After looking more at the brochures and various materials, he confidently said: “I like what you’re doing,” “You’re doing a great job!” And “Keep up the good work.” On hearing the second statement, my curiosity was raised. Any one of those statements alone could have seemed a bit unusual coming from someone who had not asked any questions and had hardly the chance to read anything except some of the headings and a few lines of text, but the three of them together, repeated? Then he took a few steps away, turned around, looked directly into my eyes for the first time and very deliberately said: “Have a great day!” I noticed something special in and about his eyes and am not sure if it was merely due to their unusual colour. It seemed as if he was conveying that he already knew, or perhaps that was merely my own interpretation. And it did turn out to be a very good day. I had never had so many conversations with people who showed such genuine interest in the state of our planet and what needs to be done, which I’ve found to be rare at expos like this. The majority who came seemed very open-minded and willing to listen and engage in a discussion that was hopeful and energizing. I came away even more certain than before that there are a great number of people who are in line with the core of our message and some with a deep desire to do something about it, but just don’t know where and how to start. I’ve also thought strongly for some time about the need for all those who truly care about humanity and are concerned about the state of our world to join forces as I come across so many individuals and groups who are working along similar lines in one way or another tackling what seems to be the seismic task of transforming our world, whether it be focused toward eradicating poverty, enforcing human rights or restoring the environment. But all their efforts seem scattered somehow and their impact not as powerful as it could be if they all came together. And only the day before, I was entertaining serious doubts about the efficacy of this venue and approach for the Reappearance work. I had also been struggling with a lot of weakness and fatigue for a number of days, but as the day progressed felt considerably better and uplifted with a new-found energy that I could not explain. Could you kindly say who this man was? S.K., Potomac Falls, VA, USA. 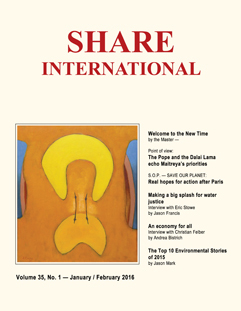 Each month I very much look forward to reading the hard copy of Share International magazine – something I have been doing for some three decades! Thanks to you and to everyone connected with getting this publication to my home. At our June 2015 Spring Festival public presentations at Solstice House in Boulder, Colorado, Share International co-worker Ron Liggett gave a talk and I did a Transmission Meditation presentation and meditation. After the meditation, I did something I had witnessed Benjamin Creme do at public lectures. I asked those present for a show of hands of who would try Transmission Meditation again. A good portion of the group raised their hands. What caught my attention were two smiling young men standing in the back of the small room we had rented. They gave me the impression their enthusiasm was just short of jubilation. They raised their hands and shook their heads up and down in a big ‘Yes’. For a split second I half expected one of them to jump up and down. They smiled broadly, and as I recall, each waved two-thumbs-up. I made sure they saw our handout with the phone numbers of group members who host Transmission Meditation in the Denver Metro area. For several weeks I looked for them to attend our group meditation. Alas, I never saw them again. Is it possible they were spokesmen for the Master Jesus? On Tuesday 27 October 2015 Adrie and I were having a coffee in the front part of the Share Nederland Information Centre in Amsterdam. A gentleman with a slightly dark complexion opened the front door and said, “Jesus Christ is coming.” He shut the door again before we could finish our reply: “Yes, He is already here”, and we watched him through the display window continuing on his way. He was smiling the whole time and radiated inner calm and happiness. The impact of these few seconds was amazing in terms of energy; he left us with such a happy feeling. Are we right in thinking he may have been a spokesman, for the Master Jesus? A.v.D., M.L., Amsterdam, the Netherlands. We live on an island in the Indian Ocean. On 26 December 2015, around 00.42hrs, we thought we saw Maitreya’s star. We wanted to film it but, unfortunately, my husband’s portable phone battery was flat. We were able to observe the star carefully as it was moving slowly. It was quite bright, different from the other stars. Its colour was a brilliant yellow. We made a search on Google in hope to find out what it could be, and found the articles about Maitreya. We immediately understood that this was the star we’d seen. We were surprised. We have a strong belief in Jesus Christ and are wondering why the star appeared to us. D.and C., Baya, Mauritius Island. In the spring of 2015 our group put up a roadside billboard advertising a Spring Share International Expo. After the Spring expo we organized another expo for the fall and were discussing whether or not to keep the billboard up. Was it the best advertising for our funds or should we look at other advertising? Our billboard contract was due to expire in a few weeks. On Sunday in mid-June I was driving by the billboard on my way to Transmission Meditation and was thinking about this when a truck suddenly sped by. It was similar to mine with the same faulty taillight but was white in colour. On the back of the truck was a big bumper sticker that said ‘Shamballa or bust’. I felt encouraged and thought to myself “there’s the answer – go for broke.” The truck sped ahead and stopped at a light. The passenger rolled down his window and had a few words with a neighbouring driver and then they sped off again. The driver seemed to be quite husky and the passenger much smaller and wore an ivy cap. I saw the truck repeatedly on the way to meditation until it finally disappeared over a bridge. Our group ended up keeping the billboard up as well as pursuing our other advertising ventures. Would the Master be so kind as to confirm whether or not the truck driver and passenger were anyone special? Share International gives extracts below from recent speeches and writings by the Pope and the Dalai Lama. In this month’s article, ‘Welcome to the New Time’, Benjamin Creme’s Master refers to “a group of wise individuals showing humanity the new situation”, and among them He singles out Pope Francis and the Dalai Lama. According to Benjamin Creme, they are doing the work of Maitreya and helping to sway public opinion by their tireless example. Retracing the days of the past year may happen either by remembering facts and events that bring back moments of joy and sorrow, or by seeking to understand whether we have perceived the presence of God who renews and sustains all things with his help. We are called upon to ascertain whether the course of world events has been carried out according to God’s will, or whether we have primarily heeded the plans of man, often rife with private interests, an insatiable thirst for power, and gratuitous violence. Today, however, our eyes need to be focused in a particular way on the signs that God has conveyed to us, so as to physically touch the strength of his merciful love. We cannot forget that many days have been marked by violence, death, the unspeakable suffering of many innocent people, of refugees forced to leave their homeland, by men, women and children without stable shelter, food and sustenance. Yet, many great gestures of goodness, love and solidarity have filled the days of this year, even if they did not become television news. Good things do not make headlines. These signs of love cannot and must not be obscured by the contempt of evil. Goodness always wins, even if in certain moments it seems weaker and obscure. This is the objective that the Church sets for herself this Holy Year. Thus, we will reinforce in ourselves the certainty that mercy can really contribute to the building of a more human world. Especially in these our times, in which forgiveness is a rare guest in the ambits of human life, the call to mercy is more urgent, and this in every place: in society, in institutions, in work and also in the family…. But it is necessary to keep in mind that, at the root of the forgetfulness of mercy, there is also self love. In the world, this takes the form of the exclusive search of one’s interests, of pleasures and honours joined to the desire to accumulate riches, while the life of Christians is often crossed by hypocrisy and worldliness. All these things are contrary to mercy…. I and my colleagues belong to the 20th century. Our time has passed and our lives are nearly over. The 21st century generation on the other hand are just at the beginning. They have a realistic opportunity to change the world. We all want happiness and to avoid suffering, and within ourselves that involves a greater sense of love and compassion. As far as the external world is concerned it will entail taking serious steps to preserve the environment and adapt to climate change. These days scientists are increasingly finding evidence that cultivating love and compassion has a positive effect on our physical health and general well-being. Humanity is made up of individuals and we will only achieve a happier more peaceful society if those individuals are happier and more peaceful within themselves. I am optimistic about this. I believe that human nature is fundamentally positive…. It is important to remember that all human beings are fundamentally the same. We are all brothers and sisters belonging to one human family. We are born the same way and we die the same way. And yet instead of appreciating what we have in common, we tend to stress those differences between us, such as faith, nationality, whether we are rich or poor, educated or illiterate, which are of secondary importance. We see each other in terms of ‘us’ and ‘them’, which in terms of the interdependent world in which we live is not only unrealistic, it’s out of date. If we adopt a more affectionate, appreciative and concerned attitude towards each other, our lives will become more meaningful. If we can contribute to the happiness and prosperity of the whole world, it will be worth leading a long life. We are all part of humanity, 7 billion of us who are fundamentally the same as human beings. Of course, there are differences among us of faith, colour of skin and colour of hair, some of us come from different countries and speak different languages, but these are secondary differences. The primary thing is that we are essentially the same. Many of the problems we face, we make for ourselves, based on our mistaken emphasis on these secondary differences between us. Seeing each other in terms of ‘us’ and ‘them’ and being motivated by a strong sense of self-centredness are the source of violence, killing and corruption in our world. Instead we have to make an effort to promote a sense of the oneness of all human beings. We have to think about the welfare of the whole of humanity. If humanity is happy, as individuals we’ll all be happy. On Sunday 29 November 2015, Share International co-workers from groups in the South of England met to join an estimated 50,000 people on the Climate Change march in London. People from all walks of life and ages were represented, with a few in marine costumes and some characters from the stage production of The Lion King. The speeches were led by songs from the Scandinavian Arctic First Nation, who also walked at the front of the demonstration. Maitreya in the guise of an Indian holy man at the London Climate Change March, 29 November 2015. At the end, we walked back to Parliament Square outside the Palace of Westminster, where I saw a portly, white-bearded Indian holy man dressed in silver and gold ceremonial robes. He moved about the people, talking to some of them. I wondered who he was and left our little group and went towards him. I asked: “Do you have a message for us?” He replied: “Message? I don’t have any message. I am, I just am. We are all interconnected, all together in unity. We are life! We are love!” Then he turned to talk to another person. I returned to our group and a co-worker wondered if there was a possibility of taking his photograph, so together we returned and he gave his permission. She asked the holy man where he lived and he replied that he lived in everyone’s heart. She also asked him why he was wearing a necklace of 13’s. He replied that it was a symbol that appears in all sorts of guises; in the OM, the Christian Cross incorporates 13 in that the lower, longer arm is one and then three additional upper arms. It can be seen in mandalas and everywhere in Nature; it is a universal number. Would you kindly ask your Master if he was anyone special? Is there a blessing at the bottom of the photo? Benjamin Creme’s Master confirms that the encounter was with Maitreya in the guise of an 'Indian holy man'. The light on the photograph is a blessing. According to a report in WND (WorldNetDaily), angels and crosses have appeared on photographs of the sky in different parts of the US. “Is God showing Himself in the sky?” asks Christian Today. Mechaele Loraff in Buchanan, Michigan, stopped her car to photograph an unusually beautiful sunrise on 13 January 2016. “I did not see [the cross] till after I took the picture,” she said. “I was focused on the sunrise and the beam of light going straight up!... I’ve never seen a light pillar before and the cloud reflecting the light from it and making it look like a cross just made it even more beautiful to me!” The next day NBC’s Nightly News covered the event. This photo, taken during a praying workshop some years ago and sent by B.P., Maribor, Slovenia, shows a light blessing from the Master Jesus. This phenomenon, seen all over the world, is manifested by the Space Brothers in collaboration with Maitreya. Photo taken by M.M., Tokyo, Japan, on 22 December 2015, near the Kojimachi Transmission Meditation building. We present a selection of quotations on the theme of ‘The new civilization’. The quotations are taken from Maitreya (Messages from Maitreya the Christ and Maitreya’s Teachings – The Laws of Life), Benjamin Creme’s Master (A Master Speaks and Share International), and Benjamin Creme’s writings. Allow Me to show you the way into the New Time; to outline for you the glories, which, if you will, can be yours. Man is made to serve both God and man, and only through that correct service can the path to God be trodden. Make it your task to take upon yourselves the task of re-orientation, reconstruction and change. Shortly, from the blueprint of the future now descending, will precipitate the forms of the new civilization. Each nation has a part to play, bringing to the structure of the Whole its own particular voice. In this, the United Nations will play a vital role, co-ordinating the plans for reconstruction and redistribution…. When men look back to this time they will see it as a stepping-stone to Grace. Today’s chaotic turmoil is nothing less. From this turmoil will emerge the new forms which will grace the new civilization – new and better forms which will provide for men everywhere, and gratify the hearts of everyone. [Maitreya’s initial task] will be concerned with inspiring humanity to create the conditions in which world peace can be guaranteed. He will show that this requires, above all, the acceptance of the principle of sharing. This will insure a harmonizing of the imbalance caused today by the tremendous discrepancies in the living standards of the developed and the developing nations. [The new civilization] will come as a result of the transformation in humanity of the sense of who we are: the development of the sense of interdependence, and the correct distribution of the energy of the Will – in particular of the Will to Good, which creates right human relations. The new civilization, based on right relationship, is the next predestined, planned advance for humanity, on every level – politically, internationally, socially, scientifically, culturally, in education, and so on. Eventually, the education of the young will go forward in a very systematized way. The science of the antahkarana will be an intrinsic part of the new education which will create the culture from which the civilization stems…. Among humanity today is a growing number of men and women who are engaged in outlining the principles on which the new civilization will be built. They are to be found in almost every country, and they propagate the teachings which reflect the qualities of the New Age of Aquarius. They are to be found in every department of human living, and are to be recognized by their altruism and keen response to human need. These are the forerunners, sent ahead to prepare men for the experiences which will characterize the New Age. Some few of them work consciously, aware of their mission to aid a struggling world and of their connection with Hierarchy, but the majority work solely from the promptings of the heart and their desire to help. At the foot of the mountain, My brothers, the climb upward seems steep indeed; but when the first steps have been taken, the progress is rapid; and near the mountain top, winged feet shall you have; and from that height shall you see the glories of God. Thus shall it be, My friends and brothers. I, Maitreya, promise. Long-time readers of Share International will have already accepted the fact of the presence in our midst of extraterrestrial visitors, the Space Brothers. Although their presence has been witnessed by hundreds of thousands of people worldwide, governmental agencies and their accomplices still go to extraordinary lengths to persuade people that they did not see and experience what they know they saw and experienced, and that such phenomena do not exist. The new book by Dutch author and educator Gerard Aartsen, Priorities for a Planet in Transition: The Space Brothers’ Case for Justice and Freedom, serves as an authoritative guide through the deliberate misinformation that has surrounded this issue for decades. Aartsen amplifies the information presented in his previous book, Here to Help: UFOs and the Space Brothers [see review in SI January/February 2012] and conclusively establishes the following: They’re here, and they have been for decades. They have visited us for millennia. Their mission is one of benevolent service. And they do no harm. Ever. More compelling information emerges in Aartsen’s latest book: the fact that the effort to discredit the presence of the Brothers and the benevolence of their mission is methodical and orchestrated by the governments of the world, especially the government of the United States. In 1959, Howard Menger, an early contactee, stated: “Government officials in particular refuse to tell because it would upset our economy. The knowledge they [the Space Brothers] have gained depicts an entirely different way of life. It is living under God’s law rather than man’s law. Most mechanical energy sources would become obsolete” (p.4). Chilean contactee Enrique Barrios, who was directed to render the information given to him in the form of a children’s story, Ami – Child of the Stars, writes: “The problem is not in the people, but in the systems they use. People have evolved, but systems have remained backward. Bad systems make good people suffer. These systems make people unhappy, which finally turns them bad” (p.62). Along with the growth in our collective consciousness inevitably goes one imperative. We will have to learn to use our free will far more intelligently and compassionately than we have so far. Our inability to do so has resulted in what the Space Brothers call “cosmic isolation”. As pioneering contactee George Adamski was told during a visit to a Venusian mothership in the 1950s, “If man is to live without catastrophe, he must look upon his fellow being as himself, the one a reflection of the other. To have a healthy and prosperous society, that which causes the most trouble must be removed. As we all know, this stigma is poverty in the midst of plenty. It is the cause of sickness, crime and the many evils that we know” (p.48). And it is a symptom of the belligerence humanity regularly demonstrates that so far makes it impossible to trust us with more advanced forms of technology. Enrique Barrios writes: “When the scientific level overwhelms the level of love in the world, that world self-destructs.... If a world’s level of love is low, there is collective unhappiness, hatred, violence, division, wars and a dangerously high level of destructive capacity” (p.45). Again according to the information given to Stefan Denaerde in 1965, “To supply technical information to a people like yourselves is a serious crime against the cosmic laws” (p.61). It is probably clear to most readers that there is no discrepancy whatsoever between the teachings of the Space Brothers and the teachings of Maitreya and the Masters of Wisdom, and the Great Sages down through human history. In the third chapter of his book Aartsen delineates how adherence to these great laws has led to the creation of incontrovertibly peaceful, functional and flourishing civilizations on other planets. Critical to the creation of these civilizations has been an understanding of collective necessity: that that which is truly good is good for all. George Adamski writes: “In their community way of life, with respect toward one another and with life’s necessities provided for all, they find no need for penal institutions. Because the people on Venus, Mars and elsewhere in our system have learned to live harmoniously with one another, they have no tensions and consequently no sickness” (p.88). It seems appropriate to counterpoint these words with those of the Tibetan Master Djwhal Khul, Who writes: “The keynote to good health, esoterically speaking, is sharing or distribution, just as it is the keynote to the general well-being of humanity” (p.92). If the Space Brothers demonstrate limitless patience and good will toward us – and they do – it is in part because they remember times long past on their own planets when they faced some of the dilemmas and serious conflicts that beset us. And, like the older brothers that they are, they know that, through adherence to the Great Laws of Life, we can overcome our problems as they did. There is a great deal more fascinating information in Priorities.... than has been touched upon here, including this moving perspective about Earth shared with Stefan Denaerde: “This is the blue planet with the blinding light, the home of the graceful, long-legged human race. It is one of the most beautiful planets that we know.” (p.19). Using an intellectually rigorous four-point method of research and verification which he calls “critical synthesis”, Aartsen manages to present his information in an authoritative manner without ever sounding strident or polemical. Backed by a broad-based knowledge, not only of his subject but also of esoteric literature, his writing is lucid and objective. As such, it serves as a welcome antidote to the lurid prose emanating from disinformation campaigns and wildly overheated imaginations. The book, and the story it tells, make for absorbing and informative reading. Christiana Figueres, the UN Climate Change official in charge of the negotiations at the UN Climate Change Conference in Paris (COP21), and the French hosts have been praised for guiding the summit so successfully. In contrast to previous summits with traditional international treaties having clear rules with fixed obligations (which the US Republican-controlled Senate could never approve or sign up to), the Paris climate talks involved government, business leaders and campaign groups and relied on countries to come forward with plans for cutting emissions themselves. A new solar power plant in Rwanda is set to provide half its population with electricity by 2017. The $23.7 million project is located in Rwanda’s famed green hills, 60km east of Kigali. China has supplied 28,360 solar panels which line the hills, and tilt to track the sun from dawn to dusk, improving efficiency by 20 per cent compared to static ones. Inverters and transformers have been bought from Germany and the panels are linked to a central server in Oslo, which can be monitored remotely by the internet. The project has created 350 local jobs and increased local generation by 6 per cent, powering 15,000 homes. Rwanda’s economy is at last expanding 21 years after the genocide, and this project was declared the fastest in Africa – it went from contract signing to construction to connection in just a year. It was backed by Obama’s Power Africa initiative that seeks to bring together governments, experts and the private sector to increase access to off-grid clean energy in sub-Saharan Africa. According to a new report from the US Solar Foundation, the US solar energy workforce grew in 2015 by 20 per cent (for the third year running) and the solar industry created more jobs than the oil and gas extraction sectors and the pipeline sectors combined. The latest Oxfam report confirms that the gulf between rich and poor has soared to extremes: the 62 richest billionaires own as much wealth as the poorer half of the world’s population. The charity’s report, timed to coincide with the gathering of many of the super-rich at the annual World Economic Forum in Davos (20-23 January 2016), calls for urgent action to deal with a trend showing that 1 per cent of people own more wealth than the other 99 per cent combined. Oxfam said that the wealth of the poorest 50 per cent dropped by 41 per cent between 2010 and 2015, despite an increase in the global population of 400 million. In the same period, the wealth of the richest 62 people increased by $500 billion to $1.76 trillion. In 2010, the 388 richest people owned the same wealth as the poorest 50 per cent. This dropped to 80 [ie the 80 richest] in 2014 before falling again in 2015. Oxfam’s prediction that the richest 1 per cent would own the same wealth as the poorest 50 per cent by 2016 had come true a year earlier than expected. Leading figures from Pope Francis to Christine Lagarde, the managing director of the International Monetary Fund, have called for action to reverse the trend in inequality, but Oxfam said words had not been translated into action. The charity said as much as 30 per cent of all African financial wealth was thought to be held offshore. The estimated loss of $14 billion in tax revenues would be enough to pay for healthcare for mothers and children that could save 4 million children’s lives a year and employ enough teachers to get every African child into school. Nearly 24 million children living in crisis zones in 22 strife-torn countries are being deprived of a school education, threatening their own future and that of their societies, the United Nations Children’s Fund (UNICEF) reported in January 2016. “Children living in countries affected by conflict have lost their homes, family members, friends, safety, and routine. Now, unable to learn even the basic reading and writing skills, they are at risk of losing their futures and missing out on the opportunity to contribute to their economies and societies when they reach adulthood,” UNICEF Chief of Education Jo Bourne said. The analysis highlights that nearly one in four of the 109.2 million children of primary and lower secondary school age – typically between six and 15 years – living in conflict areas are missing out on their education. South Sudan, which was thrown into turmoil when conflict erupted between President Salva Kiir and his former Vice-President Riek Machar two years ago, killing thousands, displacing over 2.4 million people, and impacting the food security of 4.6 million, is home to the highest proportion of out-of-school children. Over half (51 per cent) of primary and lower secondary age children have no access to an education. Niger is a close second with 47 per cent unable to attend school, followed by Sudan with 41 per cent and Afghanistan with 40 per cent. In countries affected by conflict, collecting data on children is extremely difficult and therefore these figures may themselves not adequately capture the breadth and depth of the challenge, UNICEF stressed. The agency fears that unless the provision of education in emergencies is prioritized, a generation of children living in conflict will grow up without the skills they need to contribute to their countries and economies, exacerbating the already desperate situation for millions of children and their families. Education continues to be one of the least-funded sectors in humanitarian appeals. In Uganda, where UNICEF is providing services to South Sudanese refugees, education faces an 89 per cent funding gap. “School equips children with the know-ledge and skills they need to rebuild their communities once the conflict is over, and in the short-term it provides them with the stability and structure required to cope with the trauma they have experienced,” Ms Bourne said. The World Health Organization (WHO) has issued a new warning about deadly levels of pollution in many of the world’s biggest cities: poor air quality is killing millions and threatening to overwhelm health services across the globe. According to WHO, air quality is deteriorating around the world to the point where only one in eight people live in urban areas that meet recommended air pollution levels. Figures soon to be released will show air pollution has worsened since 2014 in hundreds of already blighted cities. WHO describes the situation as a global “public health emergency”. The latest data, taken from 2,000 cities, will indicate a worsening level of toxicity in many places as populations have grown, leaving large areas under clouds of smog created by a mix of transport fumes, construction dust, poisonous gases from power generation and wood burning in homes. The toxic haze blanketing cities could be clearly seen from the International Space Station. It was also revealed that several streets in London had exceeded their annual limits for nitrogen dioxide emissions just a few days into 2016.